Oats Dosa is a healthy Indian bread dish that combines oats, oil among other things to create a very tasteful, tantalizing, tempting recipe.It's very delicious and yummy recipe. Just follow our quicker and easier method to make / Prepare Oats Dosa and enjoy this luscious, mouth watering recipe.If you are bored of having oats porridge everyday, for a change you can make this dosa. 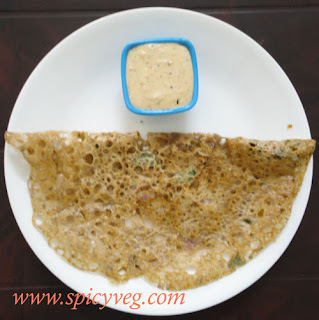 Let’s learn how to make/prepare Oats Dosa by following this easy recipe. 1.Dry roast oats for 2 mins till a nutty aroma comes and the color of oats slightly changes. Allow it to cool down then powder it finely. 2.Add little oil and saute the onions for 2mins. In a serving bowl : Add oats powder, rice flour, sooji, jeera, onion, pepper powder, curry leaves,salt and mix well. 3.Add water and make a thin batter like rava dosa batter.Heat the dosa tawa, take one laddle of batter and drizzle it from the corners and finishing off in the middle same like we do for rava dosas. Drizzle oil, allow it cook till golden brown and turn over to other side, leave it for 2 seconds then transfer to the serving plate. 4.Enjoy the crispy oats dosa hot with Chutney of your choice.